AtOne with Nature Anti-Breakage Shea Butter & Tea Tree Oil Moisturizer Organic Herbs & Vitamins Softens, Conditions & Detangles, the very best daily use moisturizer with Shea Butter, StrongEnds Conditioners, Paba-Free Sunscreen & Vitamins A, C & E. Protects during styling. Helps revive dry, damaged & brittle strands, leaving hair shinier & healthier. 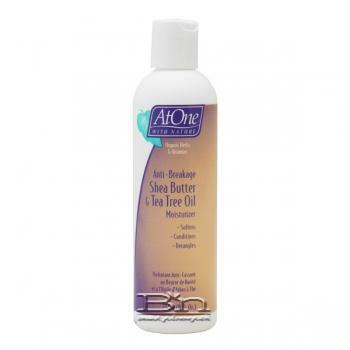 Anti-Breakage formula detangles hair. Conditions natural, blow dried, relaxed and curl styles. Tea Tree Oil soothes scalp. Excellent for pressing. Directions: Pour sufficient amount into palm. Rub hands together and massage into hair. Style as desired. Use on damp or dry hair.